Was the GTA V release date confirmed? The signs. They're everywhere. 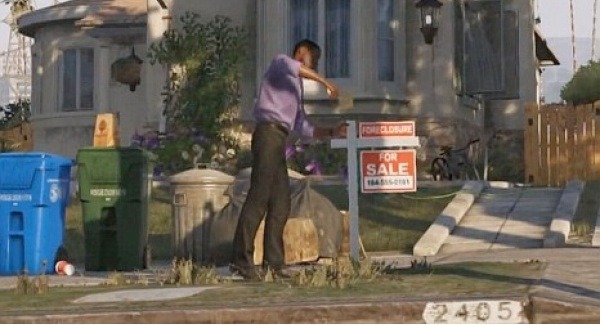 One frame in particular has been identified, as a bystander hammers in a "For Sale" sign and the curb reads "2405." Put the two together, and you have one hell of a red herring. The claims come from a particular frame in the trailer (seen below) that has a combined message of (yep, you guessed it) "For Sale, 2405," interpreted as a possible launch date for the game of 24th May. I mean search deep within people: it was the date that the song was released, the day and month that one of the co-founders of Rockstar was born, the golf course board in has the numbers 3 and 8 on it, and if you do 3 X 8 = 24 and 8-3 = 5, it all adds up to...what we feel maybe looking a little too much into things. I mean credit where it's due for spotting this; but it's all based on a bunch of "do you believe" types of questions. Do you believe that they'd make such a big emphasis of the date on the pacement? Do you believe in coincidences when it comes to such a big game as GTA V? But, quite frankly, even if this was acknowledged by Rockstar in the construction of the game (not actually just part of the city detail), we'd feel as if this was either a bit of a Red Herring, or it is and they won't mae it in time for deadline as the majority of the iterations are delayed from May to the following October. Plus Max Payne 3 is coming out a mere month before, so it'd just seem stupid to. We're going to put our money on this not being the easter egg of a release date; but it has gotten us edgy.